The varieties of ramen in Tokyo are diverse, and there are as many ramen stores as there are flavors. In fact, there are over 3500 ramen stores just in the metropolis of Tokyo, which ranks it as the most ramen-store-infested place on earth. 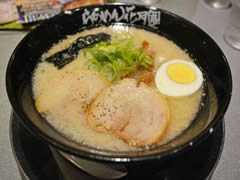 The tastes ranges from ramen with soup made from pineapple juice to the old-fashioned shoyu ramen. However, there are four main types of ramen that you should keep in mind when visiting Japan. Basic Shoyu Ramen with menma, green onions, chashu, and nori(seaweed). This ramen is sold as “中華そば(Chuka Soba)” at ramen chain-store, 幸楽苑(Kourakuen). Shoyu ramen has a long history in Japan dating back to 1910, and is the forefather of Japanese “ramen”. Because of that, Shoyu Ramen is considered to be “orthodox” by many Japanese people and is especially popular among elderly people. This ramen usually has a clear, brown soup made from chicken broth, vegetable broth, and soy sauce. There are stores that add pork bone or beef bone broth to the soup. The toppings usually include green onions, chashu, nori, and narutomaki(more info at Toppings section). 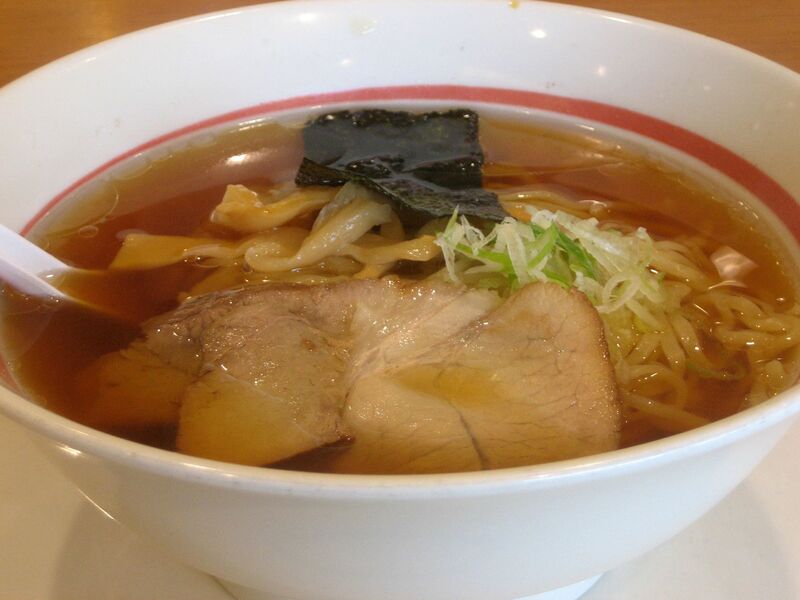 It is also possible for Shoyu ramen to be called Chuka Soba(中華そば:Chinese Noodles) or Tokyo Ramen(東京ラーメン). In Tokyo, if a menu just says, ramen(ラーメン), it is most likely Shoyu ramen. Please remember that this is not always the case as some ramen stores label their own original ramen as “ramen(ラーメン)” on their menus, especially if the stores serve specialty ramen. This ramen has a soup made from a thick broth made from pork bones. The soup is usually whitish and cloudy from the collagen and gelatin that seeps out of the pork bones. A variant with added soy sauce is called Tonkotsu Shoyu(豚骨醤油:Pork Bone Soy Sauce) Ramen. The origin of Tonkotsu ramen is in the Kyushu region of Japan, although there are several theories as to the exact location in Kyushu. A famous regional variant of Tonkotsu Ramen, called Hakata Ramen(博多ラーメン) originates in the Hakata district of Fukuoka city in Kyushu. Hakata Ramen is distinct because of its thin, straight, non-curly noodles. Ramen stands selling Hakata Ramen can be found all across Japan and there are even chain stores that specialize in Hakata Ramen. This might be the most popular ramen nowadays as ramen stores serving orthodox Shoyu ramen continue to decline. According to a poll done by The Japan Times, the most popular ramen among foreigners(mostly Americans and Chinese) was Tonkotsu Ramen with Miso Ramen coming in at second. Shio Ramen with chashu, menma, nori, green onions, and boiled egg on top. The soup for this ramen is usually made from Chicken and/or Pork Bone broth flavored with salt. The soup is much lighter and clearer compared to Tonkotsu ramen due to the broth not being boiled down as much as Tonkotsu ramen soup. Simply speaking, shio ramen is the lightest of all the ramen flavors. Miso Ramen with Menma, soy bean sprouts, ground pork, nori, and wakame(seaweed). The soup for miso ramen is made from chicken, fish, and/or pork bone broth with miso melted in. It is usually sweeter than other types of ramen. Sapporo ramen is a famous regional variant of miso ramen. Sapporo ramen usually has corn, soy bean sprouts, butter, and ground pork as toppings. It should be noted that the Hokkaido, the region where Sapporo is located at, is a major producer of corn and butter. There is a chain store from Sapporo that specializes in this kind of ramen called Dosanko Ramen(どさん子ラーメン). ・Chashu (チャーシュー): Boiled pork that is soaked in a mixture made from soy sauce and other condiments. Chashu is different from Chinese “char siu” as it is boiled, not barbecued. Many ramen stores produce their own chashu to distinguish themselves from their competitiors. ・Miso(味噌): A thick paste made from fermenting soybeans. Rice and barley may also be fermented with the soybeans. 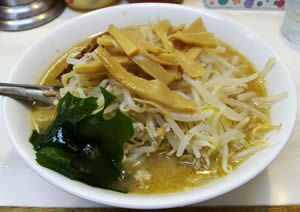 ・Menma(メンマ): Fermented bamboo shoots. It has very distinctive taste. ・Nori(のり): Dried seaweed in the form of sheets which resemble sheets of black paper. ・Wakame(わかめ): Type of seaweed usually served boiled. ・Narutomaki(鳴門巻き): A type of kamaboko that has a pink swirl inside. The name derives from the Naruto Whirlpools in the Naruto Strait. It is widely used as a topping for ramen, often shoyu ramen. The name for the manga, Naruto also dervies from this topping. ・Kamaboko(かまぼこ): A product made from a mixture of pureed fish and additives such as egg whites and salt. The mixture hardens when it is steamed; the finished product is Kamaboko. ・Niboshi(煮干し):Dried infant sardines. It is used in ramen broths. ・Se-abura(背脂): Lard. Grated lard is included in the soup of some ramen and some stores may ask you how much lard you want floating in your ramen. ・Kaedama(替え玉): Extra serving of noodles. If one bowl of ramen isn’t enough, you can order a kaedma. However, make sure you don’t drink all of the soup as kaedama will only come with the noodles. ・Ajitama(味玉): Boiled egg soaked in soy sauce and other condiments. Tantanmen. Tantanmen in Japan often differs from the ones in mainland China. Kitakata Ramen(喜多方ラーメン): A type of ramen originating from the city of Kitakata in Fukushima Prefecture. The soup is made from pork bones and niboshi(dried infant sardines) with soy sauce as its base. Kitakata ramen, along with Sapporo ramen and Hakata ramen are known as The Big Three Ramen(日本三大ラーメン). Char siu men(チャーシュー麺): Ramen topped with plenty of chashu; sometimes to the point where the bowl is encased in chashu. Abura Soba(油そば; literally:oil noodles): A type of ramen without soup. At the bottom of the bowl is a concentrated sauce usually made of soy sauce and lard. The eater sprinkles some condiments such as vinegar and chili oil according to his/her preference. It originated from Tokyo. Wanton men(ワンタン麺): Ramen with wantons. 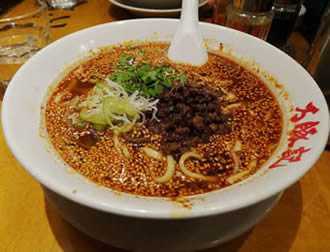 Tantanmen(坦々麺): Japanese name for Chinese Dandan noodles, a spicy ramen with toppings which include zasai(pickled mustard plant stem), soybean sprouts and fried ground pork. Kourakuen 幸楽苑 Very Cheap. One bowl of “Chuka Soba(中華そば)” costs just 290yen. Rairaitei 来来亭 Kyoto-style shoyu ramen. Lots of lard. You can specify the amount of lard added. Kagetsu Arashi 花月嵐 Original Ramen. You can add garlic for free. Ichiran 一蘭 Specializes in “natural” Tonkotsu ramen. Dosanko どさん子 Ramen store-chain serving Sapporo Miso Ramen. Tenka Ippin 天下一品 Kyoto-style ramen. Ippudo 一風堂 Hakata-style Tonkotsu Ramen with thin, straight noodles.